What is WANIC Skill Center? WANIC Skill Center offers high quality tuition-free technical and professional training for high school Juniors and Seniors. These year-long, advanced-level Career and Technical Education (CTE) programs are based on rigorous academic and industry standards and prepare students for career and college readiness. WANIC programs offer dual credit opportunities (both high school and college credit) and/or lead to industry certifications. Programs are designed in three period blocks allowing extended time to not only learn the theory of a subject, but to also get authentic hands-on lab experience. All classes earn Occupation Education high school credits and may offer other course equivalencies towards high school graduation requirements. WANIC operates as a cooperative consortium of eight local school districts. Member districts are: Bellevue, Everett, Issaquah, Lake Washington, Mercer Island, Northshore, Riverview, and Snoqualmie Valley. WANIC serves as a branch campus of all area high schools providing programs that would normally not be offered in every comprehensive high school due to high operative and equipment costs or not enough student enrollment at the school. Instructor to student ratio is low in several skill center programs, allowing the Skill Center staff the time to get to know each student and address their unique learning styles. WANIC Skill Center is one of 13 Skill Centers in Washington State. Contacts in Bellevue, Everett, Issaquah, Lake Washington, Mercer Island, Northshore, Riverview and Snoqualmie Valley School Districts. WANIC Consortium School District Calendars. Your WANIC class will follow the school year calendar of the district your class is located. This calendar may be different than your home high school. As a state-approved interdistrict CTE consortium, WANIC's primary mission is to provide quality, diverse, and cost-effective career and technical education for all students through interdistrict cooperation. 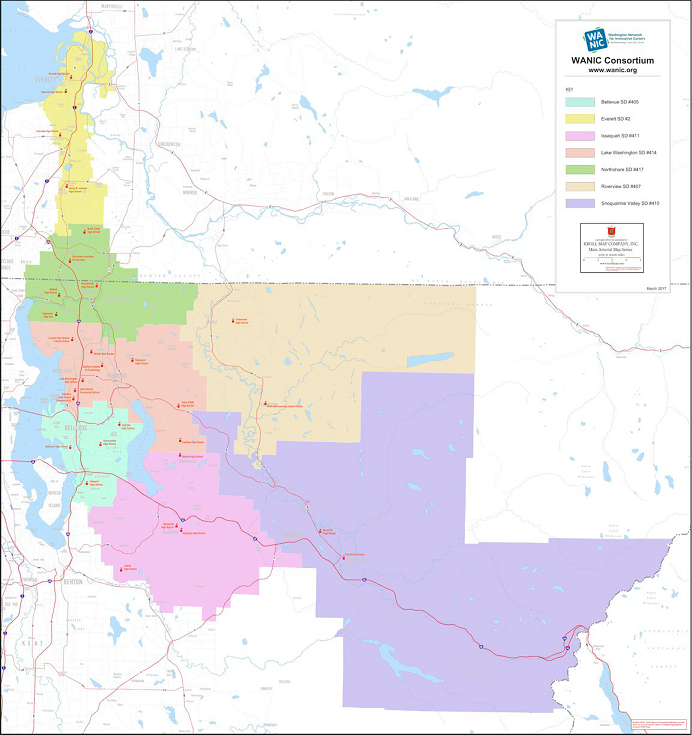 WANIC, the Washington Network for Innovative Careers, is a consortium of eight school districts in the region to the northeast of Seattle, which have been in partnership for over 20 years and share Career and Technical Education (CTE) programs. Member districts include Bellevue, Everett, Issaquah, Lake Washington, Mercer Island, Northshore, Riverview, and Snoqualmie Valley. As a state-approved interdistrict CTE consortium, WANIC's primary mission is to provide quality, diverse, and cost-effective career and technical education for all students through interdistrict cooperation. Contact information for your resident high school career specialist and registrar, who can assist you in registering for WANIC courses. Driving Directions and maps to Lake Washington Institute of Technology where WANIC classroom labs and administration are located. A chart that lists most of the high schools and program locations that can be used as a reference for distance and travel time (without traffic).